A lot of people around the world are enjoying virtual mobile mining, this is because of relatively new and upcoming mobile mining and crypto currency initiatives: Electroneum and Phoneum, There mobile miner apps make it possible to mine for there crypto coins based on POT "Proof of Time", instead of with regular mining "Proof of Work" so that it wont put the mobile device used under a heavy load but still have a competitive element to mine for. 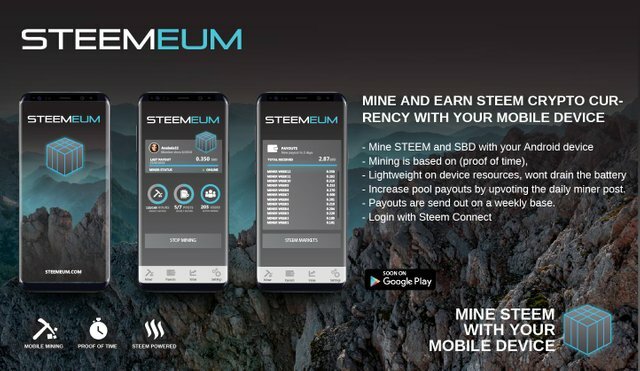 The ideology of Steemeum, is bringing to Steem users, and this growing but already very big group of mobile mining enthusiasts, the ability to mine for some Steem as well. 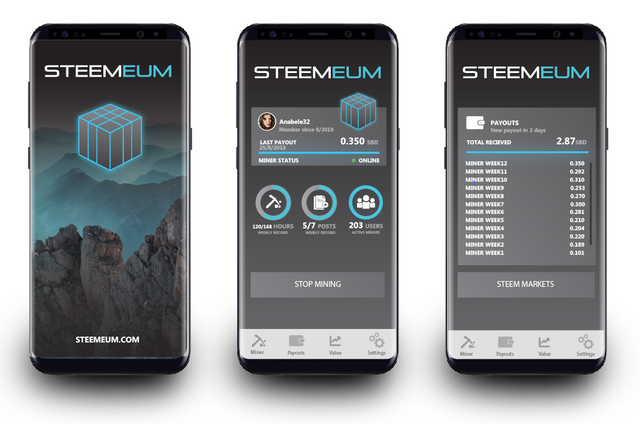 Steemeum will then be the 3rd released mobile miner based on "proof of time" and aims to be the most popular mobile miner app, with desirably similar or (of course) even better, higher payouts compared to the other mobile miner initiatives. 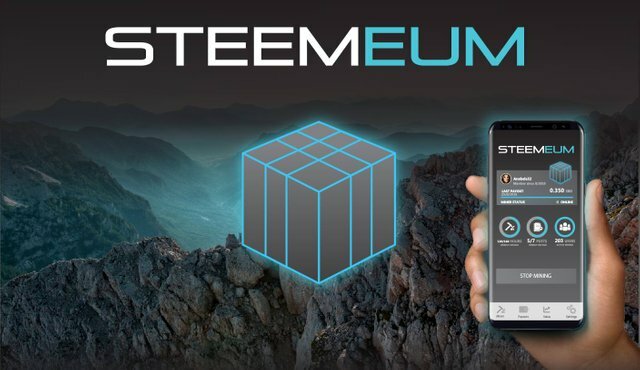 "Get weekly rewards for using the app and being committed to Steem and Steemeum"
Easy to use, micro mining with Steemeum brings Steem to a big group of unseen mobile users, users that are ready to adopt the Steem Blockchain, it's currency, Steemit and the many mobile tools around it such as Esteem, Steepshot, Actifit, Partiko, SteemWallet and others. Trough Steemeum the newly atracted users can earn some Steem, and get to know the Steem blockchain, and use there earnings on the Steem blockchain and related tools and markets. 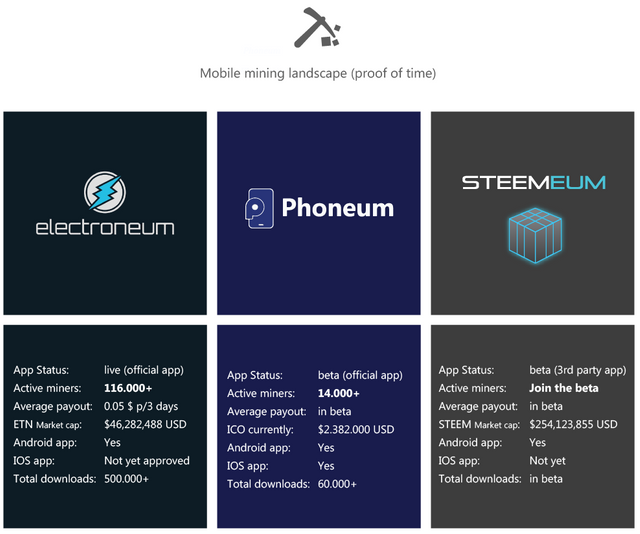 Steemeum will stand next to Electroneum and Phoneum, and will expand the landscape of available mobile miner apps, and trough there marketing and popularity, Steemeum mobile mining will parallel to it grow in popularity and on-board those new users to the Steem blockchain as well. Steemeum mining is based on Proof of Time (POT), which means the users that have the app open and mine that week the most time, will get the highest rewards. Steemeum users can upvote the daily Steemeum miner post to improve the weekly rewards pool, and with it there and other users there weekly payouts. To keep the project running, a percentage of the liquid rewards will be kept and used to pay for things related to keep the project running, for the future development and to keep the team @techtek and @flash4yard up and working on it as well. Steemconnect is used to login, when logging in it will asks for voting rights, and this will only be used when the user pressed "yes" on the dialog screen: "Do you want to auto upvote the daily post?" Where does Steemeum get the rewards to send out to the miners ? Beside that the rewards for the miner pool come in from the liquids that are generated by the daily miner post, the project is also funded by Fundition and those rewards are also used to ensure the project have rewards to send out to the Steemeum users. If the total gathered rewards are not sufficient it maybe is needed to add (preferred Steem) related ads, if you want to sponsor Steemeum and you are a Steem related project owner and want to advertise your project to the daily engaged users, than be sure to get in contact. The presented images are mockups, some things could still change and some features could be different. Have beside the Android app a IOS app. Look into supporting other platforms and devices. Combining and integrating other projects and functions into the app. Explorer and improve the proof of time mining and engagement mechanisme and look into other reward systems . Exploring the possibilities of implementing a weekly "proof of pic" . Exploring how to make it more competitive, engaging and fun with the use of game like elements. Exploring the use of a own SMT. Exploring and improving the community aspects of the Steemeum project and app. The app will be tested in a closed beta first, and will later be released in public beta. The closed beta is scheduled for this month, and depending on the results of the closed beta, the open beta app will follow soon. Do you want to be a Steemeum beta tester ? Are you excited about Steemeum mobile mining, and do you want to help to test it before it is released? Then please join the Steemeum discord for more details and the latest news and updates. Thanks for your reply and interest in Steemeum, at the moment the closed beta app is not yet available, we still need to do a bit more work on it. If you want, please join our discord channel to be notified when it is released. I appreciate your response 😊 and I have already joined your discord server and eagerly waiting for the app to be released. You now have the testing role in the Steemeum discord server, and with it can download the beta app to test from the updates channel. @steemeum more articles will be? Nobody needs your scammy token. There is no such thing as virtual mining. Call it as it is - giving away your shitcoin. Could I ask a question or two, what effect will this have on my phone battery, does steemeum use the combined computing power to actually do anything useful / profitable, thanks, I think this could be big. I mean no disrespect, but I fail to see how this is compatible with proof of brain. Would you mind commenting on that? Question are always welcome and it's a new project so understandable that it raise questions, and we want to answer them to further explain the project. Steemeum is like a contest, where the users are being rewarded for there commitment/engagement, this is measured with the proof of time mechanism, And could in the future be further expanded with other elements of competition, that further suits the mobile device it's functions, Steem and the Steemeum project. If the user don't have Steem and Steemeum daily on there mind they will forget to keep track of the app and they will not gather proof of time, and the result wil be no rewards for that user, because no engagement / commitment. If the user is committed to Steem and Steemeum, and have it on there mind daily, and the user keeps track of the app, they will be rewarded for it because it is on there mind, they are probably a ambassadeur of the app and Steem. and are less likely to leave the Steem platform, because they get at least a bit rewarded for being committed and spreading the word about Steem and Steemeum. We will try our best and we always did, to fit that initial ideology. The first step for Steemeum is with the release of the closed beta, to have similar functionality to the two popular virtual mobile miner apps, and we hope to eventually bring the audience from the competitor apps to Steem trough Steemeum, we make sure that the basic functionalities are working as expected by the users, from the feedback on the just released beta. We will be moving toward further implementing Steem related, competitive/game/content related functionalities, to have unique features, Even although the Proof of Brain concept seems to not work how it (hopefully) was intended by the creators of Steem. We will help with that initial ideology and further improve Steemeum to fit it. Hi @steemeum .. I'm trying to use Steemeum last one week but I'm not able reach or not understanding that how may get steemeum tester beta to use Steemeum or to download steemeum. Can you please guide me how can I get tester beta and steemeum download option.